Today I am visiting the lovely Sia McKye! She had some really great questions about CassaStorm, my music, and everything in between. Let me tell you, when Sia emailed me her private thoughts on CassaStorm, it was probably the most awesome thing anyone has ever said about my writing. So be sure to visit Sia! Science Fiction, Fantasy, and Horror News! White Fire by Douglas Preston and Lincoln Child, an Agent Pendergast story, comes out November 12! From Blastr - Guillermo del Toro wants to make a new film adaptation of Roald Dahl's novel The Witches. Right now the fate of the project rests in Warner Bros. hands. Looking for the best haunted house for your Halloween scares? Visit Haunt World for the one nearest you. They also list trails and hayrides. Sean MacLachlan at Civil War Horror is looking for blogging advice as he contemplates the new direction in his writing career and the future of his two blogs. Candilynn Fite had this bit of news - SCBWI announced the SPARK award for non-traditionally published children's books. You can read the rules HERE. Thanks to everyone who has purchased and reviewed CassaStorm! I’ll take reviews on Goodreads, Amazon, Barnes and Noble – I’m not picky! CassaStorm is now on Goodreads’ Best Space Opera list! (CassaStar and CassaFire are #3 and 4.) If you enjoyed it and have time to vote for CassaStorm, I would appreciate it! There were some great comments on Wednesday’s post regarding blog content and pageviews. Overall, most of you thought blogging was about community and comments more important than pageviews. … we had our Amanda Bynes post reach 180,000+ views. Did it increase our regular readers, or increase our book sales, etc? Not in the slightest. It was just a bunch of people who got a quick laugh and left. We don't really care about that, so going viral only counts if those people stick around. If they don't, then it's just empty calories that really aren't even worth bragging about. Blog views are interesting as well as searches, but comments are the only way to really know if what you said of value to anyone. And I think we all want to know we have some to say that someone else liked. Blogging really is about community and friends. It's a family-type relationship in many ways isn't it? The best blogs, for me, are the ones with humor and honesty. And those are usually the ones with the highest number of followers and comments! Are you excited about Thor? Amazed by what people can do with Legos? Little help for CassaStorm? (It would make Mini-Alex happy! He might even make an appearance next week.) Any other thoughts on blogging? Know any of the movies? And who is ready for a hayride…? Don’t forget to visit Sia McKye! Whoa - I'm at the top of the comments two days in a row? Amazing! Loved the smack scene. Gosh I have to go see that! I still think that comments and the number of them all depends on if the comments are heartfelt, I may only get a few but I know they are genuine. Enjoy your week-end. see you at Sia. That was a really great discussion on Wednesday. Interesting to see what everyone thought. I had to go check out that Lego house. They don't look like Legos...but they have a lot of variety now! Those were some cool Lego designs, though! Those are some amazing Legos! That haunted house looks nothing like it's made from blocks. I love Lego! When I was a kid I so wanted to be a Lego engineer. It must be the best job ever, building with Legos all day! I'm amazed by what those people can do with those bricks. I can't wait to watch the new Thor movie! Alex I saw #4 because I vividly remember the quote but I can't remember the name! Something to do with brain-eating slugs? There's a Legoland not too far from me, so I take my son there occasionally. It is amazing what people can make with Legos these days, especially when I have enough problems following the directions in the kits. T, two in a row - you're good! And your kids will want more Legos I'm sure. Stephanie, you're right that some don't even resemble a Lego block. Laura Marcella - professional Lego engineer! Mark, you have kids - you have an excuse! Keith - yes, you are on the right track! Sandra, that would be really cool. I played with LEGO in my childhood. I loved to create planes and ships. Wow, lots of interesting news. Legos are the #1 reason I'm afraid to go in to my sons room barefoot! That is one amazing Lego house! As for the trivia, I only know #5 Halloween. which I saw when it came out (yup, I'm that old!) and it scared the pants off me! Melissa, some of those kits are over a hundred dollars! Brian, you're a Pendergast fan? Awesome! Marcy, correct - and that makes two of us old people. Those Lego projects were amazing, especially the two haunted houses. I remember Legos, and stepping on them, and sucking them up in the vacuum. I'm so glad the boys don't play with them anymore. That said, wow! Truly amazing what they can do with them! Great discussion about comments and visits. Visiting the lovely Sia as soon as I exit your blog. *Really* enjoy Sean's writing. Could it be because he sometimes writes about Missouri? Nah. Love Thor and all the characters of the Marvel franchise. Woah, that lego house is beyond incredible! I would have never known. I wish every time my 4 year old nephew drags me to look at his latest lego creation that it is something like that, lol. And I'm pretty sure #2 is Army of Darkness and #4 is Night of the Creeps! They scared the bejesus out of me as a kid! I'm not positive on the others. I think one of them is The Thing, but that can't be right since it's not the same year....this makes me frustrated considering I'm such a horror movie buff, lol. Oh and btw, I LOVE Jane and Thor! Can't wait! Dude, I love that you share my admiration of all things Pendergast. I'm so behind on these books, though! I think the last one I read was the one where they were on that cruise ship and there was a cursed idol of some kind??? That was years ago! Madeline, I know I don't want to see it. Carol, he's just a good writer! Clarissa, you got two! And it may be a while before your nephew shows you something like that. Julie, I lost track a bit while he was searching for his wife. This one is a stand alone, which is good. Thor 2 is the one I am waiting for! I need some hero Thor and some evil Loki in my life! Just placed my votes (for your books, that is). I'm also really excited about Ender's Game (even though I know they changed it, it's probably going to be better for screen the way it looks from the previews), and my whole family is looking forward to Catching Fire next month. Sia is super fab! I'll be heading over to check it out. And very cool news about SCBWI. It's about time. Dont know any of the trivia answers but #2 and 4 are hilarious. Wow to that Lego haunted house! How do I get that job of building masterpieces with Legos??? Those Lego constructions are amazing! I'll show them to my kid, he'll be inspired. I am excited about Thor and the Prendergast novel. I don't do scary hayrides or haunted houses. I'm chicken enough without trying to scare myself on purpose. Love that clip. We actually watched Thor again last night. I'm excited for this next one. Hey, thanks for helping spread the word on the SPARK award. I think it's fabulous! I love the Lego haunted house. Headed over to see what sort haunts are located in my area. Thanks for the link. ...and back fro Sia's -- great interview! 1. No clue... "Friday the 13th part 27 -- Jason joins Avon" maybe? 2. Oh yeah -- "Army of Darkness" I love Ash and the original Evil Dead series. 3. Ummm. I know this.... Dang. "Invasion of the Body Snatchers" Or "The Thing" I think. 5. One of the Halloweens. I think maybe the original? 6. The name gives it away -- "Reanimator"
I want to see Thor, but...Natalie Portman????? In the name of all that's holy. And yeeeesss! Can't wait for Thor, love haunted anything and wow! That was really Lego? Congratulations on being a best space opera writer! I didn't know that about Guillermo. Is "The Witches" a good read? I haven't seen that particular book. It must be if Guillermo is thinking of turning it into a movie. I hope it happens! Yes, exquisite haunted house, I like! That Lego haunted house is outstanding work! I can only imagine how much time it took to complete. Tell Mini-Alex he has my vote for Best Space Opera! Congrats! That Lego haunted house is incredible. Heather, sounds fun to me! And you got those three - not bad. Tyrean, I think the film will be good. PK, wouldn't that be an awesome job? Patricia, that's a cool birthday present. Candilynn, thanks for posting about it. Chris, maybe there isn't a plural? And you got four! Michael, no idea - I actually don't care for the author. River, I will tell him! I can't believe that house is made of legos! That blows my mind! I'm heading over to Sia's now. That is an amazing house! Looking forward to seeing you over at Sia's! That lego haunted house is amazing! I haven't seen the first Thor film yet, it's on my to-do list! haha people can do much with lego indeed. i know 4 is wrong. I would LOVE to see Guillermo Del Toro do an adaptation of The Witches! I think it would be amazing! I didn't really like the 1st Thor movie, besides that he's very pretty to look at, but then I'm not a huge superhero fan. So don't take my opinion on it as valuable. Very happy that CassaStorm is stirring up quite a storm on the bestseller lists. So far all the reviews of your book that I have read have been amazing. Have a lovely weekend Alex. Oh my gosh I love that Lego haunted house. Amazing! Headed over to GR to vote now. Have a great weekend! Dagnabbit...blogger ate my long comment. Sigh. Yes to review when done. Reading three blogging buddies' books which all came out at the same approximate time...good thing the genres are so different or my brain would probably explode. yay candilynn! and yay you alex! have a great wknd! I have a(nother) Lego post scheduled for... some point. You're a master at choosing one liners, Alex. Even remembering them is beyond me. Off to visit Sia. Laura, thanks for letting me know! Pat, you got six. And Re-Animator is twisted. Tina, that made me laugh! No exploding brains. That's a good clip from Thor. I'd like to see that movie! Hopping over to Sia's! Just wanted to tell you: I WATCHED GRAVITY. It was seriously one of the best movies I've ever seen. It was INCREDIBLE, and the two actors were fantastic, and the graphics were amazing, and... gosh, it was just AMAZING. oh goody! A new Lee Child book to read! Love that guy! Have a super weekend, pAl. That Lego house is pretty amazing. I can manage a ray gun and that's about it (no, it's not the letter L, it's a ray gun). SC, knew you'd like it! Suze, correct! And really wish I could share what she wrote, because it was just amazing. Moody, I built a shuttle once. It wasn't very good though. I'm definitely excited for Thor! And congrats on your books, Alex! Wahoo - congrats on being on the best space opera list! That's awesome. It was interesting to see the Haunted House site. Brought back memories of my old job in the haunt industry. Don't guess I need to say anything about blogging since I'm saying plenty on my site already and will keep yakking a bit more about it next week. I'm trying to get to the nitty gritty of the story. And I really enjoyed the interview over at Sia's place! Christine, any excuse to play with Legos, right? Congrats on making the Space Opera best seller list. That lego haunted house is way cool. Thanks for the lovely interview Alex! I watched Thor on DVD and will probably do the same for the second one but, I am looking forward to seeing it. Good news on the SO bestseller list. Woo-hoo for Candilynn--that's gotta feel good. I love the lego house. Amazing. I think the important thing is the purpose of your blog. If it's to promote there is a different approach. If it's for followers and community involvement yet another approach. It's nice when I see a high number of visitors for a particular blog post. I do have quite a few that follow privately and only occasionally will comment. comments are important. To be honest I write what interests me on my day (Mondays) and I've been surprised with the number views for those articles and where they come from. I've loved the comments. I try to make the guest posts fun or informative and look good. Comments are important since comments tend to grab the attention of the search bots. You don't have to be huge to get the interest and placement but you do need the comments. What counts most with me, as far as authors are concerned, is the number of buys their books get. I had a couple pub reps that tracked those clicks to buy--there is a gadget they asked to put on the blog and I'm happy to say there are a lot of buys. That makes me feel good. :-) It means I've done my job in promoting effectively. An adaptation of The Witches. I liked that book. If they do end up pushing it through, I just hope they do it justice. Oh no. That last one is from Reanimator. That movie was a blight in my imagination. I'm still mad at that professor for having it as part of the class. I'm more into the community aspect of the blogging world as well but it was really interesting to read the comments and thoughts from others. Seriously, that's a Lego house? Dang, I never built anything like that with my Legos when I was a kid. wow, I LOVE that lego house!! It's amazing! Hi Alex - it's amazing what they can do with Lego .. and I love that Halloween House ..
Blogging is community - so essential in this day and age ... as your readers say ... and which you evoke here so well. Alex, I loved loved loved your interview with Sia. Sia, thanks again for hosting me. And it does matter the focus of your blog. Your site is the perfect hybrid of book blogger and writer. Plus what counts for you is really nice! JE, correct, and it was one twisted film, wasn't it? Hilary and Karen, thank you! Ooh Preston Child the dynamic duo of suspense! Anything is possible with Legos. That Lego house is freaking amazing. My haunted house goal this year is to finally make it to Hallow-Scream at Busch Gardens, but I'm not sure if I'm going to pull it off. We'll see. That Lego house is amazing, but don't you wonder who has the time to create something that detailed? I don't even have time to write a decent blog post each day. Love that clip from Thor. Can't wait to see that movie! I just left a comment over at Tossing It Out about blogging (again) and I see that it is still a theme here, too. Hmmmm. Are you two in this together???? What people do with things like Legos constantly surprises me. 'My husband said exactly what you said about the idea that a person won't read a self-pubbed book simply because it has been self-pubbed. I included it in this post in order to represent a lingering, if diminishing, stigma--and to respond to it. On my way to visit, Sia. :) Have a great weekend! Hmm... the most active blogs have honesty and humor? I think you just described part of why this particular blog is so popular :) That, and your enormous, amazing efforts to build community. Thanks, Alex. Loved your interview with Sia. Also enjoyed the smack scene, that's quite something. Your #6 comment struck me as funny, don't know where it came from of course. Hope Cassa Storm continues to do well. Yes, I hope that visitors to my blog are not empty calories! Stephanie, it's a lot of fun - you should go! Patricia, I don't have the time! Robin, no, I just took the theme in a new direction! Suze, I appreciate that! Maybe you can change that, as I still feel like a newbie geek with a couple books. Jo, I almost guarantee you've never seen the film. 4 - I remember the line but cannot recall what film...although I probably saw it. Congratulations Alex on making the list, twice! And I am excited by Thor. Looking forward to it, although I don't feel Natalie Portman is a good fit for the gf. Don't get me wrong, I do like Portman, just not in this role. Loved Thor: The Dark World Love that Jane! Congrats on being on the Best Space Opera list! That's fabulous. I'm without email at the moment. Can receive, but can't seem to send. Working on the problem, but will have to resort to Twitter/blog comments to communicate with peeps for a while. Just when I'm trying to do a promo for Alligators! My stars will not align this year. Love the Lego haunted house! What a fun creation for Halloween! Larry, you got four right! My kids love legos, I just wish they weren’t so expensive. Also, it's awesome to see your books do so well! I'm hoping to start reading your trilogy soon. (: And thanks for the Thor/Jane tease, I can't wait to see the movie when it comes out. in my humble opinion Jane's response to Thor's return gets an A++++++++++++ because that guy totally could have stopped in to check on her before disappearing back to Asgard and he just did not bother, plus she probably had worried he was dead up until the point he appeared for AVENGERS. Cool Lego house. I'll check out the haunted house site. I'm off to read your interview at Sia's. I'm always amazed by what people can create with Legos. Thanks for sharing that amazing haunted house. Do not, under any circumstances, set up a blog as part of multi-media platform after you published a book. Having a blog after the fact is one sure fire way for people not find out more about you. It's always better to start a blog prior to becoming published (if your main goal is to publish novels). That way you can spend a little time building a decent fan/reader base and thus get some built in word of mouth for your writing. Can't tell you how many blogs I've stopped reading because writers set then up way after the fact and thus become nothing more that place to perpetually pimp a novel. I'm looking forward Thor. Did you see the sneak peek at the end of Ironman 3? Congrats on CassaStorm making the best seller list. Elise, I hope you enjoy them when you do start reading. Amalia, my wife completely agrees with you. Kirsten, I like the way you think. GB, that's why I'm glad I started a year before my first book. I WANT that Lego haunted house!!! I'm addicted to Halloween, boo! My ex-"fiancé" and I used to build Legos all the time. He really got me into building intricate structures, though he really angered me when he took apart the dwarves' mine I spent so much time making because he wanted some pieces in it for some custom creation. He's got several secretaries at his parents' house to hold all his creations. The one Lego creation I really want to buy, if it were less expensive, is the Taj Mahal. The Leggo house looks great! It is a little like the Psycho house as others have suggested. I have a copy of CassaStorm, looking forward to reading it. Angela, you could build one. Yeah, right! Carrie-Anne, bummer! Bet the dwarves' mine was really cool. My teenage daughters are excited about Thor! I was more impressed by the lego house. Great comments you highlighted. Even if they didn't stick around, I would be pretty excited to get 180K+ views on a single post. Best space opera? Yahoo! Big fan of Legos -- really enjoyed the new Star Wars section at LEGOLAND. I read this on Friday and then got distracted. I'll head in over to Goodreads now. oh, man. That Thor clip?? Why, yes. I will visit Sia today. Thanks. Congrats of making the Best Space Opera List! Heading to Sia now. Milo, I'll have to visit Legoland some day. Liz, if you make anything awesome, please post a photo. There are so many good movies coming out. Finding time to see them all is going to be the trick. Go Jane! That Lego haunted house is sooo cool. We passed a haunted forest on our way to the mountain yesterday, but didn't stop. It was intriguing and maybe if my son were a little younger... As for page views, they really don't mean much. My huge spike post got over 300 in one day (big for me), but sadly it was the post about my friends' son that died. Not worth the hits. But it is fun to see what random posts end up popular. Soooo waiting for Thor to come out! Good interview with Sia McKye. It makes you wan there to be more of the Cassastorm series. Shell, I don't think they mean much. Toinette, sorry, I am definitely done. I'm backtracking. Yes, my human is too tired to comment. That haunted house would be perfect for C.Lee McKenzie. I see you quote Keith and Keith would be correct. Keith might also realise that commenting back in some fashion to the comments on his site would be a nice added touch. Humour and honesty and variety are excellent traits to share on a blog. Stopped by Sia's blog to check out the interview. It was great! I'd have never guessed that the haunted house was made from Legos. I've got 2 large bins of Legos that my son doesn't want to part with. Might have to pull them out this winter and see what we can create. I'm having one of those weeks when I need some insecure writer love!! Maybe I just need a hayride. Now that I can read CassaStar, CassaFire and CassaStorm without a waiting break, I picked up all three for Kindle reading. Congrats again, Alex! And yes, definitely looking forward to Thor. White Fire also looks very good! That haunted house is Lego? I want it! I want it! 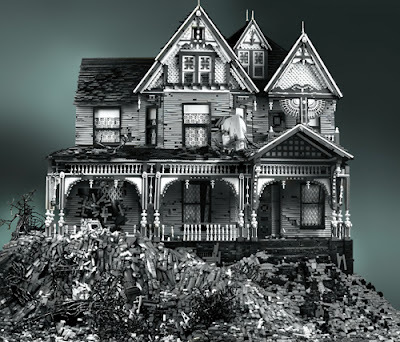 Very cool Lego haunted house. That XMen trailer doesn't really tell me anything about the movie. I guess that's a good thing, maybe? That is an amazing Lego creation. So much can be made with those colored blocks.